As part of a £2bn investment programme over the 2016-19 period, Vodafone is to hire 2,100 in what appears to be a growing trend by telcos to improve customer service by bringing call centre roles back to the UK, from South Africa and an external agency. 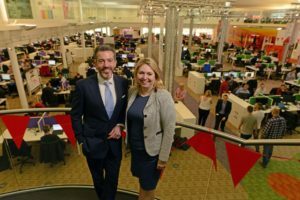 Over the next 24 months, Vodafone UK will create 800 jobs at the company’s existing customer services centre in Manchester; 150 new jobs in Newark; 150 new roles in Stoke; and approximately 100 new jobs at its existing Glasgow contact centre. At the end of 2016, Vodafone was fined a record £4.6m for failing customers for mis-selling to customers, inaccurate billing and poor complaints handling. Vodafone said the issues were due to errors “during a complex IT migration”, which involved moving more than 28.5 million customer accounts and almost one billion individual customer data fields from seven legacy billing and services platforms to one. Secretary of state for Culture Media and Sport Karen Bradley commented: “Vodafone is one of our country’s great international success stories and it’s fantastic this global organisation is demonstrating its confidence in the UK by creating new jobs across the north, in the Midlands, in Scotland and in Wales. Vodafone UK chief executive Nick Jeffery concluded: “These new, skilled roles will make a real difference to our customers and a real difference to the communities that are the focus of our customer services investment.